The other day, I came into our den to find that Ryan had recruited our kids to sit and watch an older sports movie called “Facing the Giants.” It was mildly popular when it came out but what it lacks in blockbuster appeal, it more than makes up for in inspiration. I was in and out of the room getting things ready for some dinner company but ended up planting myself on the couch for a few minutes at just the right time to see the scene which is known as the Death Crawl scene. If you have five minutes, you should totally watch the clip here. I will warn you. You might want to have your hanky ready. In this scene, a team leader (Brock) hasn’t been pulling his weight to lead his team. In an effort to teach him a lesson, the coach has him crawl on the field with another player on his back. Brock believes that he can only go about 20 yards in this position. The coach challenges him to go 30 yards. Then the coach blindfolds Brock and the entire football team stands watch as the challenge begins. Very early into the challenge, Brock’s will power and belief in himself begins to wane. The coach literally gets down on the grass and speaks encouragement into Brock’s ear. It starts out soft, but soon turns into loud, yelling, cheering and intense motivation. Because Brock is blindfolded he has no idea how far he’s crawled. He has no idea how much ground he’s covered and how much he has left to reach his finish line. I love the way the intense dramatic irony builds as the team, the coach and we, the audience, know what Brock doesn’t know. The coach is motivating him to go the distance. When Brock finally finishes, the coach has cheered and encouraged him to the end zone; instead of crawling 30 yards, he’s gone 90. As I do in nearly every sports movie (a la Karate Kid when the “You’re the Best Around” montage begins, a la Rocky IV when Rocky ditches his traditional training and the “Heart’s On Fire” montage shows him jumping rope, scaling snowy hills and escaping the KGB, a la Rudy, a la Remember the Titans, a la Billy Elliot, a la Hoosiers, We Are Marshall and The Blindside…), I began to get teary-eyed when I see that Brock is no longer relying on his own strength to carry him (and his teammate) down the field. He begins to rely on the confidence, motivation and push that his coach is giving him. Because of my writer-brain, my feeler-personality and my need to constantly connect the dots between life and everything I read or see fiction, I began to think about the lessons this scene could teach me not about football, but about life. We all go through times and seasons when it feels like we are carrying extra emotional or mental weight on our shoulders. Life can be tricky under routine, normal circumstances, but add in another load or burden to carry and the extra pressure and weight can make our challenges feel insurmountable. Sometimes when life gets difficult the best thing we can do is stay in motion. Keeping momentum even when we may not feel like it is crucial. A wise counselor once told me that “isolation is desperation.” When life’s moments feel heavy and tough, don’t sit out, don’t bow out, don’t isolate yourself. Keep moving. Keep driving. Don’t quit. In moments of defeat or fatigue or emotional turmoil, I tend to slide into a place where I don’t give my best. I feel too overwhelmed to reach or achieve perfection so I tend to operate on a “just enough to get by” mentality. Even when I don’t feel like I can, doing and giving my very best can keep me going. Giving my very best to my family, myself, my faith…all of it will help me cross the next hurdle. Just when it feels like the extra weight is going to squash you and press you down, try to remember to just keep putting one foot (or one arm in Brock’s case) in front of the other. Keep trying. Keep going. Often we aren’t in a race against someone or something; often we are in a contest against ourselves. Spoiler alert: you will win. I can sometimes rely too much on the literal, practical and tangible aspects of life. Sometimes I need a focus-shift. I need to dig down deep and forget what my head is telling me. I need to draw upon what is in my heart. I need to draw upon my calling, my passions, those intense longings deep within. Sometimes the final push, that-storm-before-the-calm, can be the most intense and painful. That’s when it’s time to negotiate with yourself and remind yourself that these feelings, this pain, this frustration is only momentary. This, too shall pass. It’s just discomfort and I can live with discomfort. The times I have wandered through a difficult season, it has been crucial for me to listen to the wisdom and provocation of others who are cheering me on and want the best for me. I find this measure of reassurance and confidence in my faith in God and the truth of his Word. I get it from Ryan and a small circle of encouraging friends. Sometimes it’s best to quit listening to your own defeating self-talk, negativity and mis-beliefs and start listening to the truth and firm reassurance of your people. 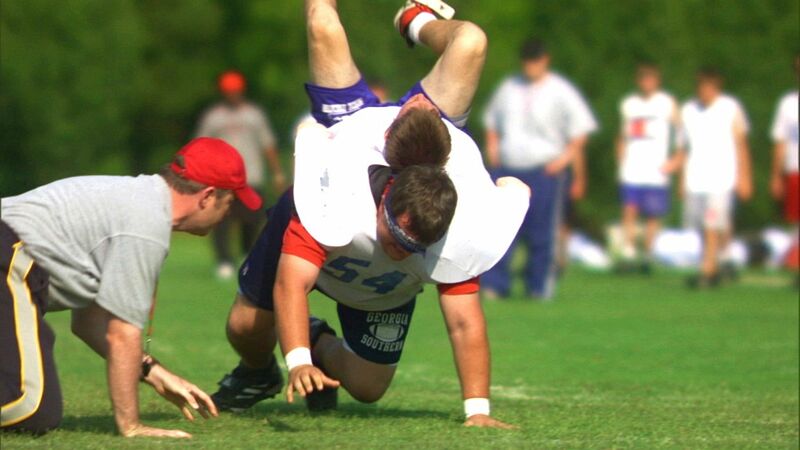 This is my “dam-breaker” moment when watching this clip from Facing the Giants. Brock, cashed out, spent, exhausted, done…has nearly collapsed under the weight of carrying 160 extra pounds on his back the entire length of a football field. He has no idea what he’s just achieved. He cries out as the coach removes his blindfold and says “that’s gotta be it, I don’t have any more.” Oh, how many times have each of us been at what feels like the end of our rope and we just know that mind, body, spirit, we, like Brock, don’t have any more? We have nothing left. We are gassed and we are exhausted, expended and prostrate. When coach Taylor tells him to look up and see how far he’s come it just breaks me. He tells Brock to “look up, you’re in the end zone.” I cry because I’ve metaphorically been where Brock is. I’ve been there when I’ve had to relocate as a Tennesseean, a Texan and a Georgian in the past four years. I’ve been there when I had to get through a deployment. I’ve been there when I had a difficult, high-risk pregnancy. Heck, I’m there some weeks with homeschooling, parenting, marriage, military-life, or ministry. Aren’t we all? All of the pain, trouble, and difficulty we endure is always for a purpose and for a reason if we choose to see it that way. These moments not only DE-fine us, but also they RE-fine us. Today, I pray that your short-sidedness amidst your troubles would be put into perspective. I pray that you’d be reminded of what you need to do in order to make it a few more yards, a few more feet, a few more steps to your end zone. Thank you, I needed this today when I thought I couldn’t crawl another inch.